Our final Assembly Gathering of 2017 has come and gone. 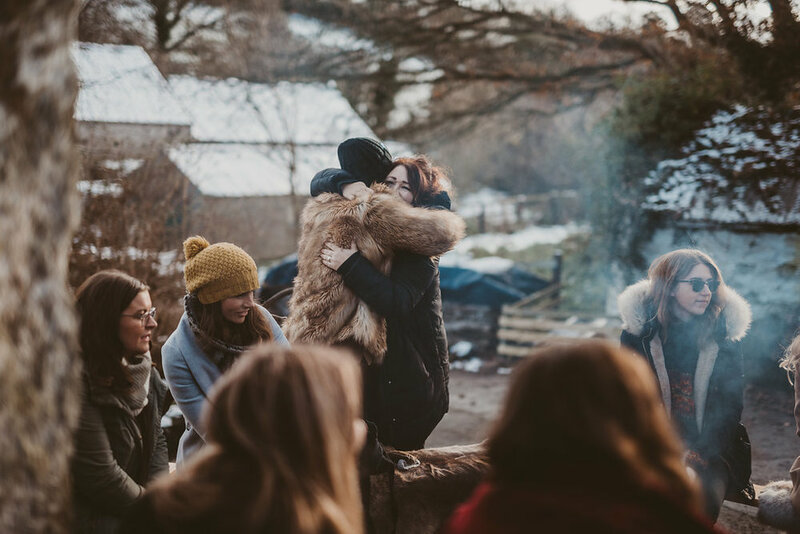 On Sunday afternoon 35 of us huddled around campfires, dined on delicious local food, foraged in the freezing sunlight and forged new friendships. With ice and snow covering most of the country over the weekend, it felt like madness to be hosting a dinner and workshops in a stone barn at the beautiful property of Laura & Ben in Downpatrick. Miraculously though, the sun came out as people were arriving and it wasn't long before we forgot about the cold and immersed ourselves in conversations, food and making. We forgot about the cold. We forgot about the cold. Maybe if I write it a few more times it will be true. It was cold. A year into running Assembly Gatherings has taught me a lot about the power of female resilience; of the wide open hearts of women who want to connect. Each time we have a gathering it feels like we are steadily building an army of supportive women, ready to propel and promote each other. I can feel it in my bones and see it in the way people are connecting both online and in person. Once everyone arrived safely and the ice (literally and figuratively) had been broken, we headed into the barn for lunch which Grace and I had set up and Grace styled beautifully as our dining spot (big thanks to the lovely Laura for also helping out, and to Linen Me for the gorgeous linen table napkins). Our host Laura (who runs the gorgeous tipi venue Finnebrogue Woods) had been busy cooking up the most incredible meal for us in her kitchen down below the barn. We feasted on moroccan roasted chickpeas, carrots and feta to start, steamy hot beef and prune tagine (with Dexter beef - one of Laura's family businesses) and finished off with the most glorious Nearynogs chocolate and salted caramel tart that you ever did taste. We tucked in, poured the wine and Long Meadow cider and the room was filled with chatter and warmth. It was so much fun to put together the gift bags for everyone with some beautiful ethical and local treats. We had stunning prints from some of the amazing female artists that were in attendence - Lisa from White Chalk Studio and Paula McGurdy . We were also treated to some cozy socks from Thought Clothing, rich spiced hand cream from Green People and all natural calm balm from local maker A Blissful Blend. After lunch we split up and did some workshops. One half off to the forest to gather greenery for wreath making with Janice from Gathered Threads and the other half huddled into the back room of the barn to roll truffles and learn about bean to bar chocolate making from Northern Irelands only stoneground chocolate makers - Nearynogs! Meanwhite back in the barn, Dot and Erin were leading us in a chocolate tasting session, sharing about their family business and giving us truffles to roll and take home. Can you even get over how beautiful these images are? Sheesh. Kat Mervyn captured the day perfectly for us and I'm so grateful. Kat is not only a mega talent behind the lens, but also makes me howl every time she opens her mouth. Thanks so much to everyone who braved the snow and ice to come and spend the day together and the wonderful team of women who helped to make it happen. I am keen to develop Assembly in the coming year - to see how we can really bolster support for creative women here in Northern Ireland and use the big pool of female talent here to learn from. Here's to Assembly Gatherings 2018!